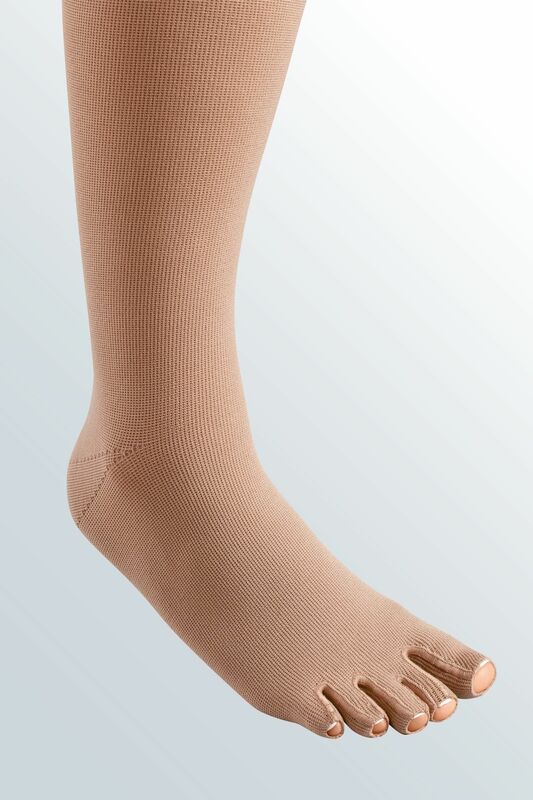 For many patients, lymphological care with their flat knit compression stockings ends without taking the toes into consideration. 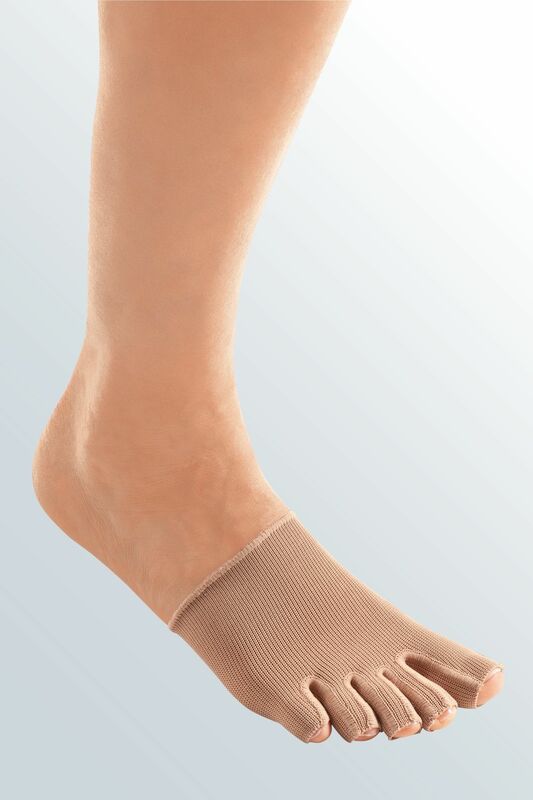 This gap in the care of lymphoedema of the forefoot, toes and top of the foot can now be even more specifically closed with the new medi toecaps. 85% of all patients with lymphoedema are unable to pull up a skin fold over the fingers or the second or third toe – they have a positive "Stemmer's "sign. 75% of affected people have swelling over the top of the foot (see H. Weissleder et al, Erkrankungen des Lymphsystems [Diseases of the lymphatic system], Viavital 2011). The comfortable mediven mondi model is also available as a toecap for a wider selection, more variants and increased comfort. It is available in compression classes 1 and 2; the leg garments are also available in compression class 3. 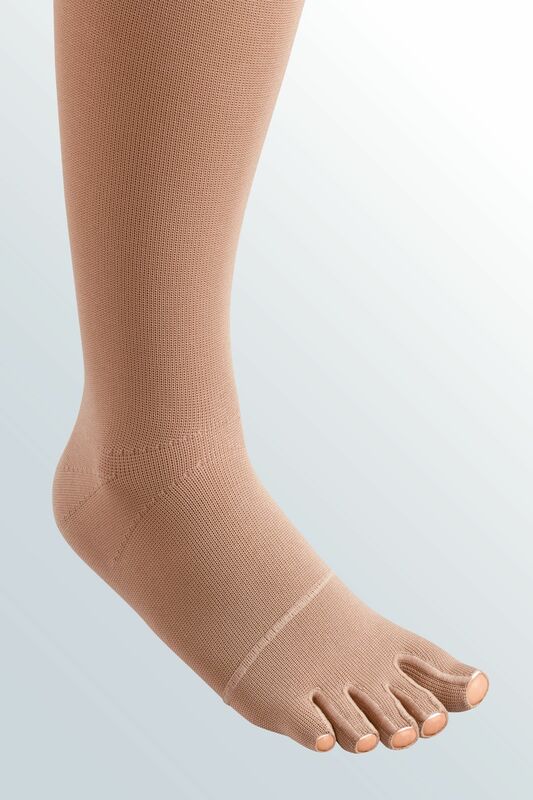 The mediven 550 Toecap is available as usual in classes 1, 2 and 3; the leg garments are also available in compression class 4. Whether – brand new - fully knitted, classic individual or sewn on, all toecaps are available with closed or open tips of the toes. They can be made up individually, optionally with or without small toes. The variant without small toes is a very popular and tried-and-tested model, because the lateral pressure of the edge of the shoe compensates for the compression of the garment. With the mediven 550 and mediven mondi models, the toe cap is not only available in the standard colours sand, cashmere, caramel and black, but also in trend colours such as medi magenta, navy, anthracite, aqua, cherry-red, moss green, mint green, coral and denim blue. Special fashion highlight: the mediven 550 models are also available with the design elements ribs, stars and pyramids and with the fashion elements down to the bases of the toes in all three toe cap variants. Each toe is anatomically made to measure and thus provides an optimal fit. medi lymph pads can also be incorporated over the back of the foot. Clima Fresh in the leg garment and as of now also in the toecaps, gives the knit its antibacterial effect and ensures that legs and feet stay fresh until the evening. The special spinning technique guarantees the effect, even after washing. Clima Comfort technology stands for reliable climate exchange throughout the stocking, regardless of the season. The stocking is air-permeable and active breathing and transports moisture immediately to the surface. This means comfort in wear and feeling good the whole time the garment is being worn.